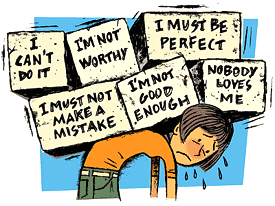 Most of us do it at some point – we doubt our ability to meet our own (or others’) expectations of ourselves, we compare ourselves to friends on social media, or we use a lot of “should have” talk (I should have done better at “x”). For example, have you ever gone to a yoga class or the gym and compared your body, or abilities, to others around you? Has a work expectation or deadline caused internal doubt or fear to surface? Or, has there been a day where you’ve just felt “meh” and subsequently told yourself a story about how you “should have” been better in some capacity that day? Most likely, you’ve endured some degree your inner critic nagging at your self confidence or spiking your stress levels. After all, the possibilities to criticize our own efforts, abilities, and looks – are quite vast! However, it doesn’t have to be that way (or at least as often). Observe. Sometimes, by simply taking a moment to observe our mood, we can slow the cycle. To do this, next time you are feeling doubt, stress, or sadness take a deep, long breath and curiously observe where you feel emotion in your body. Then, determine if there is an inner critic at work, and if so, start to see what story line is attached to the given critique or mood. Label. Once you take a moment to observe the inner critic, see if you’re able to label it. For example it might be the “you’re not good enough” voice, or the “you should have done this instead” voice. Whatever the negative talk is, see if you’re able to put some sort of label to it. Accept or Tolerate. Next take a deep breath, acknowledge you are feeling a little “off,” and see if you can give yourself some breathing room or self compassion to feel a bit messy. Life isn’t always perfect, its okay to be in a funk every now and then. Intention. After working toward some degree (even if its small) of self compassion or acceptance– see if you’re able to conceptualize an intention (utilizing words such as: determination, self-acceptance, courage, etc) that could help ground/calm you at that moment. Once you pick an intention, start to return to it whenever your inner critic comes back (exp: you return to your daily routine, but one of the stories you’ve labled comes back – take a deep breath, observe, label it, build acceptance, refocus your intention, and repeat). Small Doable Tweaks. After you’ve practiced putting steps 1-4 in place, see if you are able to begin observing any small adjustments you can make in your life that are aligned with your intention. For example, if you’re feeling down about how you look or how you’re performing – is there some small, doable action step you could put into action the very next day? Sometimes beginning with self compassion and teeny, tiny steps can allow space for meaningful shifts. Lastly, if you’re wanting some support and accountability around managing negative self talk/your inner critic – we’ve got your back. To get more information on our services and set up an appointment, click here.